Here's Cord #5, 810 2087A, called "Moonshadow". 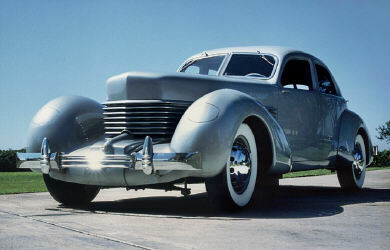 It competed in judged competition many years ago, winning Best-of-Show honors at the Auburn Cord Duesenberg Club's annual reunion in Auburn , Indiana in 1974. I bought it in 1984, with 51,000 original miles on it; the odometer passed 100,000 in 1999. It currently stands at 115,000. During this time It has received Senior Emeritus awards at Auburn in 1992 and 2006, and special recognition at several California shows. In It's November 2002 issue, celebrating the 100th anniversary of the American automobile, Forbes' American Heritahe magazine chose Moonshadow as "The Single Most Beautiful American Car". This Cord does a lot of traveling. (To see just how much, select Travels from the menu at left.) It was repainted in 2000 (after 28 years), but it still boasts much of its original blue English broadcloth interior (the worn surfaces of the front seats and three door panels were finally replaced in 2005.) It stops traffic today just as it did seventy years ago, and cruises happily on its radial tires at highway speeds. Don't let anyone tell you that a properly maintained Cord is any less reliable than any other 70-year-old car!